Cradles and Graves: 100 Posts! This is my 100th post! In celebration, I am having a contest - a matching game of the literary and cultural references in my blog. Yes, it's always high culture and fine whining here at Cradles and Graves! Match the items in The List below to the post(s) referencing it - you can use the post title or date; you get one point for each match. Anyone can enter - you need not be a babyloss/infertility gal. Lucky you if you're not. This is intended to be EASY. Almost all of the answers are in the post titles, so just look at the archive list. The few that aren't there can easily be found using the handy "Search This Blog" feature on my sidebar. Items with a * have multiple references, so there are bonus points available! There are also a few pictures on the blog that match up to items on the list. Bonus points for that, too! One winner will be chosen randomly, so you win even if you only find one match! 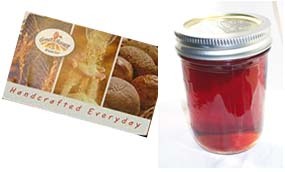 That prize is a $10 Great Harvest gift card and a jar of pomegranate jelly (pomegranates are a symbol of fertility). The person who has the most points by the deadline wins the prize shown below. If it's a tie then the prize goes to the person who got the score first. It's fine to send multiple emails - send them whenever you find matches and I'll keep a tally of your total. Because infertility / babyloss can kill the laughter and romance in a relationship (don't I know it!) the prize is intended to help you get a little of it back. The person with the most points wins a $25 Vicoria's Secret gift card, comedian Brian Regan's DVD The Epitome of Hyperbole, and some snacks to eat while you watch it with your significant other. If a winner lives in an area where they can't use the gift cards (overseas or in the middle of nowhere), then we will figure out a comparable prize. Thanks also to everyone who has read and commented on my blog. Loss and infertility has been so difficult and isolating. It really means a lot to "meet" so many wonderful people who are going through similar struggles. I also appreciate my "real life" friends who aren't going through similar struggles, but who come along on my journey through my blog. A big thank you also goes to Q, my hubby, for being so wonderful even as we've been through such horrors together in the last few years. He has never posted on this blog but he helps by finding pictures for it, which explains why there are pictures of girl fights and scantily clad women. Also, it was his idea to have the Victoria's Secret gift card as a prize. oh that sounds fun. i hope i win. congrats on your 100th post and nice to meet you. stopping by from ICLW (#31). I'm so sad for your losses but know that you are helping so many others out there. best wishes to complete your family. congrats on the 100th post and that's a great idea to celebrate it! Happy ICLW!